19th century re-orchestration. The recording mostly follows Berlioz’s intentions, with Orphée’s Act I bravura aria included (with the cadenza that Pauline Viardot composed for herself to sing), “Le Dieu de Paphos” from Echo et Narcisse replacing “L’amour triomphe” as the closing chorus, and no final ballets. It does, however, include the Dance of the Furies and the “Tendre amour” trio, which Berlioz cut. 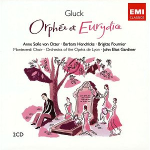 Anne Sofie von Otter’s Orphée carries the recording exquisitely. 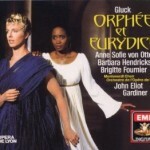 While her light, honeyed mezzo is hardly convincing as a male voice, its creamy, lilting warmth and effortless coloratura beguile from beginning to end, and while she lacks the raw desperation of, say, Kathleen Ferrier or Janet Baker, she still believably touches the hearts of both gods and demons with her tender, dignified sorrow. 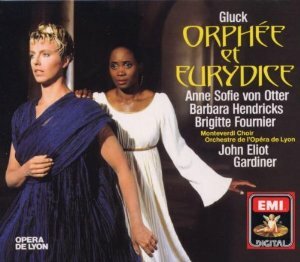 Her Eurydice, Barbara Hendricks, is almost equally appealing with her sweet sterling-sliver tone and delicately impassioned characterization. Rounding out the trio of principles is Brigitte Fournier’s impeccable Amour, sung with lithe, airy charm perfectly suited to her bright, joyful music. The Monteverdi Choir follows the lead of both orchestra and principles by singing with the perfect blend of dramatic verve and smooth-toned elegance – a feat that not all choruses achieve! 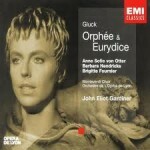 In the vast catalogue of Orphée and Orfeo recordings, this one is very high on my recommendation list. From start to finish, every moment is lovely.